Yesterday we announced the sad news that Tina the Asian elephant has sadly passed away. Tina, aged 54, collapsed in the early hours of the morning on Sunday 5 November 2017. The zoo team and veterinary staff, along with assistance from Northern Ireland Fire and Rescue Service, worked tirelessly with Tina throughout the morning. However, the extremely difficult decision was made to put Tina to sleep. Tina arrived at Belfast Zoo on 14 June 1966 from Tyseley Pet Store in Birmingham and was Belfast Zoo’s longest resident. The cost of shipping an elephant was £20 and at that time, it was necessary to provide three bales of hay, half a sack of oats, half sack of bran and eight large loaves for the journey. When Tina first arrived at Belfast she measured one metre in height and weighed about 150 kilograms. During those first few months, a keeper slept with her to keep her company and feed her during the night. For the first few years Tina had a daily walk with her keepers until she became too large. Tina became well-known for her mischievous behaviour in the zoo. She was notorious for stealing and eating visitors’ items, including handbags, coats, gloves, school bags and cameras. She also destroyed lawnmowers and had a penchant for picking locks in the old zoo. Tina also displayed a sensitive side and often rescued small birds and frogs that got into her enclosure. When the new zoo was developed the largest and most expensive house was the elephant and giraffe house. It officially opened on 27 May 1988 and this became Tina’s new home. 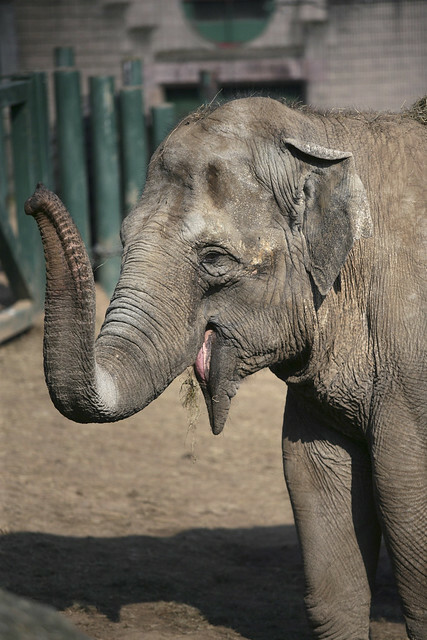 Tina lived with a number of elephants over the years but was most recently joined by Yhetto and Dhunja, in 2009, when the decision was made for Belfast Zoo to become a retirement home for these iconic animals. Tina was one of the oldest elephants in the European breeding programme. Belfast Zoo’s elephant sanctuary is an ideal place to care for older elephants, with soft sand to walk on and daily care including mud baths and pedicures. Belfast Zoo’s mission is to be a major force in conserving and safeguarding habitats and wildlife to make a significant contribution to their survival in the future. The zoo creates conservation links between captive populations of endangered species being managed ex situ (outside of its natural habitat) and wild populations being managed in situ by supporting a number of conservation projects. Belfast Zoo supports the Asian Nature Conservation Foundation (ANCF), a non-profit charitable trust. If you would like to make a donation to the campaign to support the conservation of Asian elephants, in Tina’s memory, visit http://www.asiannature.org, or alternatively you can donate in person at the Zoo, by phone or by posting a cheque payable to Belfast City Council.